"Overall, the tour was amazing! As my first time travelling solo, I felt comfortable..."
"Excellent and a memorable trip." "Great experience. Overall very much satisfied. 5 star services from Yolo. 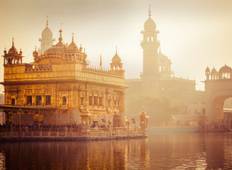 100%recommended...."
"Traveled to India in April and loved it! Such an amazing country and phenomenal to..."
"I have done many trip in my life but this tour, with this guide (Manish Dutt Sharma),..."
"Mountains & Mystics is a fantastic trip going to places many other trips don't go..."
"I am so glad that we booked this trip with Colourful Indian Holidays! Narendra made..."
"I cannot say enough good things about the staff at Gets Holidays. I booked an 11..."